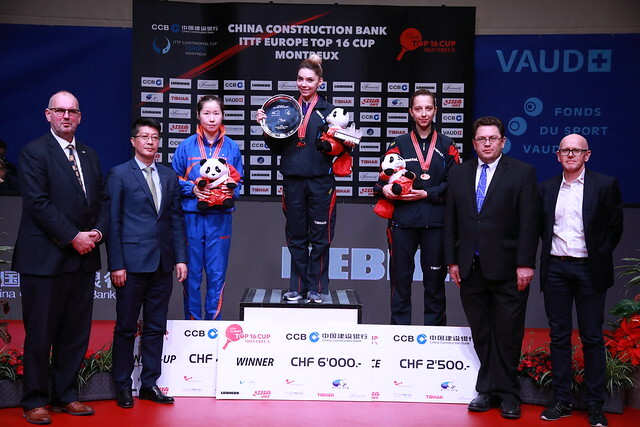 Nothing new, Vladimir Samsonov of Belarus, alongside the German duo of Timo Boll and Dimitrij Ovtcharov booked semi-final places in the Men’s Singles event at the China Construction Bank 2018 ITTF-Europe Top 16 Cup in the Swiss city of Montreux, by emerging successful in the round of the last eight on the evening of Saturday 3rd February. They have seen it all before, for the player who completes the quartet it is unchartered waters; Denmark’s Jonathan Groth is in illustrious company. The 27 year old, making only his second appearance in the tournament, his debut being last year in Antibes when finishing in third place in his group and not thus not progressing to the main draw, rose to the occasion. Occupying the no.8 seeded position in the competition, he beat Russia’s Alexander Shibaev, the no.14 seed (4-11, 11-6, 11-6, 11-5, 12-10) to keep his hopes of a place in the Liebherr 2018 Men’s World Cup very much alive; a top three finish is needed to reserve a spot in the prestigious annual event. Success for Jonathan Groth, a result that reflects the consistent improvement the Dane is making; on the 2013 ITTF World Tour in the Czech Republic he was beaten by Alexander Shibaev. Impressive from Jonathan Groth, it was the same from Timo Boll, Dimitrij Ovtcharov and Vladimir Samsonov. Winner of the Europe Top 12 on five occasions, Timo Boll, the no.2 seed, beat colleague, Bastian Steger, the no.10 seed (11-7, 9-11, 11-5, 13-11, 11-6); Dimitrij Ovtcharov four times the champion and the top seed in Montreux ended the adventures of Greek defender, Panagiotis Gionis, the no.15 seed (11-7, 12-10, 7-11, 11-9, 13-11). Meanwhile, not to be left, Vladimir Samsonov, the no.9 seed and also four times a winner, ended the hopes of Sweden’s Mattias Karlsson, the no.12 seed (11-9, 11-8, 11-7, 10-12, 14-12). At the semi-final stage Dimitrij Ovtcharov meets Jonathan Groth, Vladimir Samsonov opposes Timo Boll. Proceedings conclude in Montreux on Sunday 4th February.